Canadian police were still seeking to identify a motive the morning after a shooting at a mosque in Quebec City on Jan. 29. Two men had been arrested after the gunfire subsided, one at the scene and one after contacting 911. One person was released on Jan. 30 and described by police not as a suspect but as a witness to the shooting. Six men were killed and 19 injured after gunfire erupted during evening prayers at the Centre Culturel Islamique de Quebec (Quebec City Islamic Cultural Center) in what Prime Minister Justin Trudeau called a “terrorist attack on Muslims.” Police have yet to confirm that assessment, and no group has claimed responsibility for the attack. The now sole suspect was identified as Alexandre Bissonnette, a French-Canadian university student. Police are now describing the shooting as a “lone wolf” event and report that they are not seeking other suspects. “Muslim-Canadians are an important part of our national fabric, and these senseless acts have no place in our communities, cities and country,” the prime minister said in an official statement released soon after the shooting. “Canadian law enforcement agencies will protect the rights of all Canadians and will make every effort to apprehend the perpetrators of this act and all acts of intolerance,” he said. Political leaders around the world quickly expressed their sympathies, including President Donald J. Trump, who is currently embroiled in a controversy around his ban on refugees and visa holders entering the United States from seven Muslim-majority nations. Pope Francis condemned the shooting and expressed condolences in a telegram addressed to Cardinal Gerald LaCroix, archbishop of Quebec. The Holy Father shared an embrace with Cardinal LaCroix, who was visiting Rome at the time of the attack and has since returned to Canada. The Archdiocese of Quebec has expressed its solidarity with the local Muslim community and is planning to release a statement soon. The archdiocese encouraged local residents to attend a vigil tonight, and other vigils are planned for the evening of Jan. 30 across the country. The mosque has previously been the target of Islamophobic acts. Last year, a pig's head with an attached note that read “bon appétit” was left at the front of the mosque, a gesture offensive to Muslims who are prohibited from eating pork. In the last year, especially following an influx of refugees under Mr. Trudeau's administration and in light of terrorist attacks in Europe, Canada's Muslim population has been increasingly targeted. In 2015, an Ontario mosque was burned down, and hate crimes against Muslim-Canadians have more than doubled in the last three years according to Statistics Canada. During the last prime minister race, incumbent Stephen Harper said he would consider banning the wearing of the niqab for all public servants. 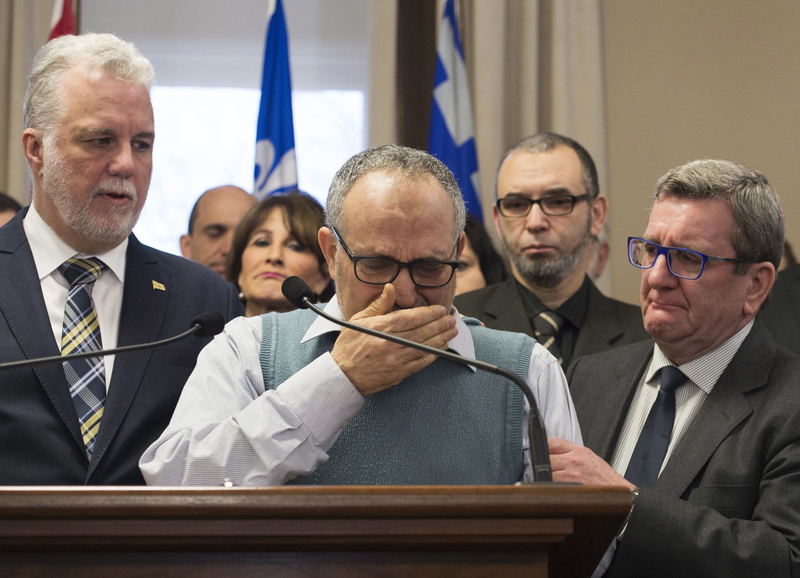 Quebec's Muslim community is especially subject to secular pressures, as the province continues to legislate against public displays of religious faith, not unlike a similar secularist trend in France. In 2013, the Parti Québécois proposed a controversial “Quebec Charter of Values,” which critics said was part of a secularist war on religion, targeting Muslims especially. Correction on Feb. 3 at 1:38 p.m.: The proposed "Quebec Charter of Values" was misidentified as the "Charter of Rights and Freedoms." Correction on Jan. 31 at 2:53 p.m.: White House Press Secretary Sean Spicer was misidentified as Scott Spicer. Dean Dettloff is America's Toronto correspondent.